xxxii, 704 p. ; 29 cm. Gazetteer providing information about more than 23,500 towns in Central and Eastern Europe where Jews lived before the Holocaust. 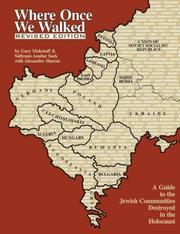 Where once we walked : a guide to the Jewish communities destroyed in the Holocaust / by Gary Mokotoff and Sallyann Amdur Sack with Alexander Sharon. 100 ME:PersonalName 1 $a Personal name Mokotoff, Gary. $c Statement of responsibility by Gary Mokotoff and Sallyann Amdur Sack with Alexander Sharon.